The hardest thing to do nowadays is to find a product with a good price-to-quality ratio. The vast majority of multimeters that are available on the market at the moment are either too expensive or not worth buying. Many people have a common problem of overpaying a particular model. However, that doesn’t mean it’s necessarily bad or poorly made. In fact, most people overpay a product because they don’t use half of the offered features. Our goal is to give you a better insight into the capabilities of different models. That way you don’t have to lurk around the Internet for hours and searching for honest and unbiased reviews. Instead, take a look at our reviews, and you’ll certainly find something of interest. 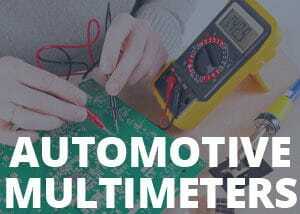 We’ve covered most of the multimeters that are worth checking out. You’ll save a lot of time, effort, and most importantly – money. We write honest reviews so that you know what are you buying and getting. You’ll avoid unpleasant surprises and disappointments. This particular model is designed for professionals who deal with HVAC devices on a daily basis. It has a sturdy and durable design, great precision, and good accuracy. You can measure capacitance, frequency, temperature, and more. It comes with 11 functions and 0.5% basic accuracy. When it comes to versatility, this model is near the top. It will fulfill most of your needs, even under unfavorable conditions. If you’re an absolute beginner, you might want to look for a simpler unit. Don’t get it wrong, it’s not a complicated unit per se, but it has a ton of features you don’t need if you’re not a professional which leads to overpaying. That said, if you know how to handle a precise tool, don’t hesitate to check the Extech EX505 out, it might be the thing you’re looking for. The True RMS feature is great for electricians who work under various unfavorable conditions. For example, many conventional multimeters have an issue with precision when ghost voltage is present. However, the units that feature the True RMS technology overcome the problem of ghost voltage with ease. In other words, the meters that have the True RMS integrated offer much more precision and accuracy. Needless to say, the precision and accuracy are among the most important aspects of a quality multimeter. This feature is considered a standard, but it’s still worth mentioning its benefits. Many times people simply can’t memorize the values, or they don’t have a piece of paper to write them down. However, if you have a unit with the data hold function – you’re in luck. All you have to do is press the “hold” button while conducting a test, and the unit will store the last reading until you overwrite it with a new one. While beginners and people who occasionally use a multimeter don’t think it’s a big deal, the professionals who handle electricity on a daily basis greatly appreciate the data hold option. It saves a lot of time and effort, especially in tight situations. Just like the data hold function, this one is considered a standard as well. The concept is pretty simple – the meter will shut itself down after 15 minutes of inactivity. This feature saves battery and money at the same time. Although it doesn’t seem like a major saving, you’d be surprised how much money you’d spend on batteries if it weren’t for the auto power off option. The screen on this unit is pretty good. It has a large 4000-count display which is backlit by bright LEDs. A lot of people think that the backlight is there by default. However, it’s not true. A few multimeters in this category come without a backlight, which is hard to believe but nonetheless true. Luckily, this particular model has a backlight and doesn’t have the well-known contrast issue. Although it’s expected from the screen to have a poor contrast under certain angles, this one performs pretty well even under unfavorable angles. The Extech EX505 is well-designed. It’s reliable, sturdy, and most importantly – durable. It can withstand falls, bumps, and hits without an issue. The casing has a rubber protection to ensure a better grip and mitigates falls and hits. It’s also lightweight and compact, which is pretty important for people who are dealing with HVAC devices daily. You don’t want a heavy unit in your hands or pockets every single day because it becomes a burden pretty quickly. The housing is also Double molded for waterproof protection. This particular model can measure temperature via thermocouple that’s included in the box. The concept is quite simple. If you want to measure the temperature of a certain object or a liquid, simply put the probe on the surface of the object you’re testing and wait for the results. If you want to measure the room temperature, you don’t need the thermocouple. Make sure that you don’t submerge the probe into corrosive liquids or else you’re going to jeopardize the integrity of it. This particular model is perfect for devoted professionals. It is well-designed and built to last. If you decide to purchase the Extech EX505, you can rest assured that it will serve its purpose for years. It always offers precise and accurate data, even under unfavorable conditions. When it comes to beginners, they should probably seek for something with fewer features. Although a bunch of auxiliary features is a great thing, it can be a bit confusing sometimes, especially for beginners. Furthermore, it’s not the simplest of instruments you’ve ever seen, so if you’re not familiar with the concept of digital HVAC devices, try finding something more suitable for people who aren’t experts. There aren’t many shortcomings, but some disadvantages are worth pointing out so that you know what to expect. The first thing is the temperature fluctuation. Although it’s a pretty precise instrument in general, the temperature readings aren’t as accurate as one might expect. We’ve noticed some serious deviations in the temperature mode. In some cases, the unit needs an unusual amount of time to display the values. The audible buzzer is pretty quiet, to say the least. As much as people don’t like loud instruments, this one is almost silent. The audible warnings are almost non-existent, and it bothers quite a lot of users. The backlight stays ON for only 10 seconds. While this shortcoming depends on your personal preferences, the light could stay on for longer. In fact, most of the multimeters on the market have a backlight that lasts at least 15 seconds. How long are the test leads? The leads are three feet long. One of the things that make the Extech EX505 a good buy is the length of the leads. While it can be used by people who aren’t experts, it’s not advised. It doesn’t mean it’s a poorly made product; it’s just full of additional features that are unnecessary for beginners and hobbyists. Can I check continuity with this unit? Yes, you can. You can also turn the audible warnings on and off. Yes, you can. You’ll get a thermocouple included in the box. Is it an expensive unit? No, it is not. In fact, there are many more expensive multimeters on the market with same or similar features. This one has one of the best price-to-quality ratios. The users find this unit quite useful and versatile, especially the professionals. People who handle HVAC units on a daily basis greatly appreciate the precision and accuracy of the Extech EX505. It works as advertised, it’s sturdy, and it won’t let you down even under harsh conditions. This multimeter is perfect for field work and people who work in construction sites and outdoors. On the other hand, the beginners find it pretty complex and tough to work with. However, if you take a moment and read the user manual, you shouldn’t have an issue whatsoever. If you take the pros and cons into consideration, the Extech EX505 is certainly a product that’s worth checking out. Furthermore, if you’re someone who’s dealing with electricity-related stuff every day, this multimeter offers reliable and accurate data. You can rest assured that it won’t let you down when you need it the most. The number one issue with every multimeter is that they suddenly stop working without any prior warnings. However, this one won’t just die one day. In fact, if you follow a few basic maintenance rules, the unit should last for years. On the other hand, if you don’t find it interesting enough, feel free to check out our other reviews. We’ve analyzed a ton of useful and reliable units; you have a big chance of finding something that’s worth purchasing.